Looking to rid your home of hard water? You have plenty of options to choose from on the market, but picking the right model is a tricky endeavor. This article examines the Kenmore Water Softener to help you decide if their product is right for your home. Can these units live up to their claims? Check it out! If your home is susceptible to hard water, then a water softener is an absolute must-have to keep your pipes and appliances running smooth. Choosing the right model for your home is a little more complicated than it sounds, though. With so many models on the market all making various claims, how can you tell which one lives up to its promises and is worth the investment? Kenmore is a top name in appliances, and they happen to offer an entire line of water softeners. This article examines every aspect of these devices from their functionality to how they stack up against the competition. What Is a Kenmore Water Softener and How Does It Work? The Kenmore Water Softener is a device designed to filter water containing harsh chemicals, otherwise known as “hard water.” This model is considered an entry-level unit, as well as one of the more affordable softeners on the market. Even at a lower price than other models, it boasts an impressive 41,000-grain capacity that can support up to a six-person household. Complete with full NSF (National Sanitation Foundation) certification, it’s easy to see why Kenmore’s product is so well received. To better understand how this unit works, it helps to know how water softeners operate in general. As water moves through pipes either in your house or underground, it can sift through buildups of limestone and chalk. By doing so, water picks up increased levels of magnesium and calcium carbonates. Hard water might also contain sulfates and bicarbonates. While none of these minerals are harmful to the human body, there are downsides to hard water in your home. First, hard water can have an adverse effect on your plumbing. Over time, deposits may turn into blockage points that can cause a decrease in your water flow or burst/cracked pipes. This can lead to incredibly expensive repairs that quickly drain any savings account. Second, it’s hard for soap to foam up in hard water due to the mineral content. To enjoy the benefits of a nice, sudsy bath or shower, soft water is an absolute must. You might also notice hard water from a well turning your hair a slight rust color after bathing. Finally, limescale deposits can form inside of your pipes or appliances that rely on water. You may need to de-scale certain machines to keep them running optimally since limescale can deplete their energy efficiency. Some people also experience skin irritation. The Kenmore Water Softener is salt-based, which means it utilizes a resin bed to trap calcium and magnesium from any water passing through. Specialized salt pellets are poured into the unit, which then creates a unique trap for minerals as they form into a resin bedding with the help of water. There are a few models ranging from 24,000 grains to 41,000. The higher the grain count, the more minerals a unit can remove before the resin bed needs to regenerate (which it relies on brine to do). Each has its own gallon-per-minute rating designed to work with different sized households. Once the resin is filled with calcium and magnesium, the unit drains itself via a pipe and the use of electricity. The brine works its way through the resin, removing minerals on its way out through the drain pipe. This process is activated by a timer and demand-initiated system, which measure the amount of water flowing through the machine. In the meantime, water passes from one end to the other as it makes its way through the resin. Minerals are captured near the bottom of the machine, allowing soft water flow out from the softener and into the rest of your home’s pipes. To help you visualize this process, the 24,000-grain unit can remove 35 grains of minerals per second. It regulates 7.3 gallons per minute, entering the regeneration process at a time when water isn’t being used in the home. While that’s impressive, it might not be enough for your home. To find out which grain count your home requires, you’ll need to do a little math. Follow these formulas to identify your softening requirement. Multiply your daily water use (in gallons) by the number of people in your home. Take your total gallons per day and multiply it by ten, the average number of grains in a gallon. Take your total, then multiply by seven for the days in a week. The final number is how many grains you need in a water softener. 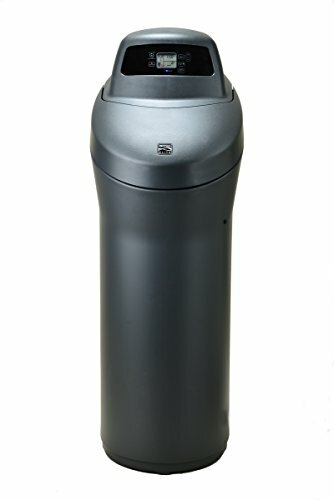 What Makes a Kenmore Water Softener Unique? 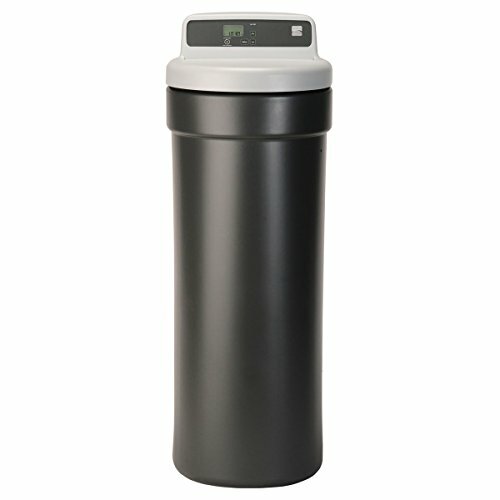 The features and certification of a Kenmore Water Softener are what make these units unique. To start, they meet the standards of the National Sanitation Foundation (NSF). This requires each model to pass rigorous industry testing and meet every claim the company makes. With an NSF certification, you can guarantee there’s no false advertising on the package. If the unit your purchase says 41,000 grains, then that’s the truth. If it says it utilizes 37% less water, then you can bet your bottom dollar it will help cut costs on your utility bill. • Smart Hybrid – This unit does not require filters to de-harden water. • 24,000 Grain – An IntelliSoft2 filter consumes 32% less water and requires 20% less salt. • 41,000 Grain – Uses an Ultra-Flow valve for increased pressure. The price you pay for a Kenmore Water Softener depends on which model you choose. Sears is the premier Kenmore retailer, and they currently offer four different units. All four models are available for free in-store pickup or free delivery. The other cost to consider is the number of salt pellets you’ll need. Sears sells Morton brand bags of 1,500 pellets (40 pounds) for $7.49. Amazon stocks several models for a slightly discounted price, but only for those with a Prime membership. The 38300 24,000 Grain model comes to $349.99, while the 38620 Smart Hybrid drops to $799.99. However, shipping times for these units range from one to three months, unlike their usual two-day guarantee. Customer reviews for any of the four Kenmore Water Softener Units were mostly around three stars. Overall, customers were highly satisfied with the product, though some did point out a few cons. The top positive reviews mentioned the efficiency of the unit from it’s ease of use to its ability to remove minerals. Others said the price was better than other models they considered, while some said that installation was incredibly easy. Negative reviews mentioned that each of the four units features a single construction design, preferring machines that easily separated into multiple parts. Some questioned how durable their softeners were, wondering if the resin bed is depleted too quickly. Finally, others experienced issues with salt bridging. Salt bridging occurs when humidity enters the machine, causing the salt to stick together instead of melting into the resin. This can cause clogs, is annoying to remedy and defeats the purpose of the softener altogether. However, salt bridging is also created by pouring too many water softening salt pellets into the device. One thing we noticed when searching for reviews is that Kenmore’s website contains a disclaimer about their customer comments. In it, they state that their customers might receive prizes or rewards if they write something about a product they just purchased. While prizes are awarded for both negative and positive reviews, people are much more likely to write something positive while feeling excited about a new purchase. Kenmore has numerous competitors on the market, but the two that compete in its water softener’s class come from General Electric and WaterSmart. All three companies create electric-powered units that require salt pellets to operate. Off the bat, Kenmore’s models have a significantly higher grain count. This is an advantage for larger homes that require water softening, but it doesn’t throw General Electric out of the competition. Their GE 30 model can remove 95 grains per gallon as well as iron from the water supply. Compared to the 24,000 grain Kenmore’s 2,100 grains per gallon, it’s easy to see which is the powerhouse out of the two. While the GE 30 is designed for smaller operations, the company does produce up to 45,100-grain models. General Electric also has a more diverse product line regarding grain count. Exclusive to GE models are a bending valve, salt saver technology, and a smart system that adapts regeneration cycles to your water usage. Kenmore’s smart features and technology might differ, but neither leads the race in performance. These models are evenly matched outside of Kenmore’s NSF certification. WaterSmart produces models with grain count ranges, differing from most others on the market. Their strongest is rated between 32,000 and 150,000 grains. Their models also remove chlorine from the water supply. Unique to WaterSmart softeners are water conserving pumps, a noise-canceling valve, and a dry brine tank that helps reduce salt usage. Like GE, these models are not NSF certified. Kenmore holds an advantage over this company with precise details about its model’s abilities, sleeker design, and a ten-year warranty as opposed to WaterSmart’s eight. If your home requires a water softener, you can’t go wrong with a Kenmore. Their lineup features a model for any size home, each is incredibly easy to use, and their certification with the NSF means they live up to their claims. We give these products a 4.5 out of 5. We feel that Kenmore could add a few improvements that its competitors offer, like the noise canceling valve on WaterSmart models. They could also benefit from the ability to use multiple types of salt softeners. However, their pros far outweigh these minor cons. As of this writing, Sears currently has a promotion for the 38620 Smart Hybrid Water Softener. You can choose to purchase the model at a $99.99 discount or pay full price and receive a gift card worth 10% more than the discount. This deal brings the cost of the Smart model down to $800 even. You can also find various seasonal deals and discounts through Sears. Both their online store and physical locations provide plenty of deals and incentives to help you save a few dollars.